در مطالعه حاضر اثر دوره‌ گردش ‌نقد بر سرمایه‌گذاری بنگاه از مسیر محدودیت مالی بررسی شده‌ است. در چارچوب یک مدل تعادل جزئی نشان داده می‌شود. طولانی شدن فاصله زمانی پرداخت برای نهاده‌‌های تولید تا دریافت وجه نقد فروش، سبب کاهش دسترسی بنگاه به وجوه داخلی و افزایش محدودیت مالی می‌شود و سبد انتخابی نهاده‌های تولید در بنگاه را تحت تأثیر قرار می‌دهد. فرضیه فوق با تخمین معادله اویلر سرمایه‌گذاری به روش گشتاورهای تعمیم‌یافته در شرکت‌های فهرست‌شدة ایرانی طی سال‌های 1375-1391 آزمون و نشان داده ‌شده دوره‌ گردش ‌نقد سبب افزایش محدودیت مالی بنگاه می‌شود. به‌ علاوه،‌ با منظور کردن دوره‌ گردش ‌نقد توانایی شاخص در پیش‌بینی ویژگی‌های محدودیت مالی در سطح بنگاه بهبود می‌یابد. این تحقیق با تأیید برخی از یافته‌های ادبیات در حیطه محدودیت مالی با استفاده از داده‌های ایران به عنوان یک کشور در حال توسعه در نمونه مورد بررسی نشان می‌دهد:1- اثر سایش‌های مالی بر رفتار سرمایه‌گذاری بنگاه‌ها معنادار است؛ 2- فرض برقراری محدودیت مقداری به عنوان سایش مالی غالب در بازار اعتبار ایران رد نمی‌شود؛ 3- ویژگی‌های بنگاه از قبیل نسبت بدهی بلندمدت و دوره ‌گردش ‌نقد با محدودیت مالی همبستگی مثبت و وجوه ناشی از سرمایه ‌در گردش، اندازه و فعالیت در صنایع با فرصت رشد کمتر با محدودیت مالی همبستگی منفی دارند؛ 4- بیشترین اثر طول دوره‌گردش‌نقد بر محدودیت مالی از مسیر طولانی شدن زمان لازم برای تولید و فروش منتقل می‌شود. We investigate the effect of cash conversion cycle (CCC) on firm's financial constraint and its investment. In a partial equilibrium model, we show that the time mismatch between cash inflows and outflows increases firm's financial constraint. This hypothesis is tested via GMM estimation of Euler’s Investment Equation, using Iranian listed companies from 1996 to 2012. Our estimation shows that CCC affects investment through financial constraints. Besides, including CCC improves the quality of financial constraint index. The improvements are sizable in predicting the micro aspects of the firm’s financial constraints. 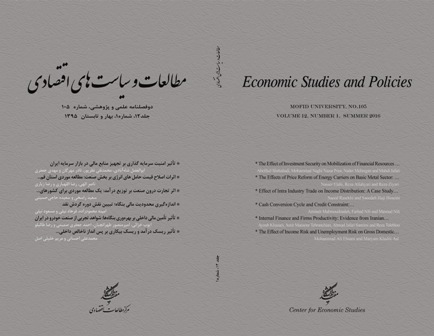 We demonstrate that in the Iranian listed companies: 1- Financial frictions significantly affect investments; 2- Dominant form of financial friction is credit ceiling; 3- long-term debt ratio and CCC positively correlate with financial constraints; though, funds from working capital, size and operating in industries with lower growth opportunities negatively correlate with financial constraints; and finally 4- Duration of the time-lapse for production and sale is the most effective channel for transmission of CCC on financial constraints. Arellano, M; Bond, S; 1991, "Some tests of specification for panel data: Monte Carlo evidence and an application to employment equations", The Review of Economic Studies, No. 58(2). Boissay, F; 2001, "Credit rationing, output gap, and business cycles", ECB Working Papers, European Central Bank, No. (0087). Bond, S., & Meghir, C; 1994, "Dynamic investment models and the firm's financial policy", The Review of Economic Studies, No. 61(2). Carreira, C; Silva, F; 2010, "No deep pockets: some stylized empirical results on firms’ financial constraints", Journal of Economic Surveys, No. 24(4). Claessens, S; Tong, H; Wei, S. J; 2012, "From the financial crisis to the real economy: Using firm-level data to identify transmission channels", Journal of International Economics, No. 88(2). Claessens, S; Kose, M. A; Terrones, M. E; 2012, "How do business and financial cycles interact? ", Journal of International economics, No. 87(1). Cleary, Sean; 2006, "International corporate investment and the relationships between financial constraint measures", Journal of Banking & Finance 30, No. 5. D'Espallier, B; Vandemaele, S; Peeters, L; 2009, "Corporate investment and financing constraints: Analyzing firm-varying investment-cash flow sensitivities", Review of Business and Economics, No. 54(4). Farre-Mensa, J; Ljungqvist, A; 2016, "Do measures of financial constraints measure financial constraints? ", Review of Financial Studies, No. 29(2). Fazzari, S. M; Hubbard, R. G; Petersen, B. C., Blinder, A. S;, & Poterba, J. M; 1988, "Financing constraints and corporate investment", Brookings Papers on Economic Aactivity, No. (1). Fazzari, S. M; Petersen, B. C; 1993, "Working capital and fixed investment: new evidence on financing constraints", The RAND Journal of Economics, No. 24(3). Fazzari, S. M; Hubbard, R. G; Petersen, B. C; 2000, "Investment-cash flow sensitivities are useful: A comment on Kaplan and Zingales", Quarterly journal of Economics, No. 115(2). Gilchrist, S., & Himmelberg, C; 1999, "Investment: fundamentals and finance", In NBER Macroeconomics Annual 1998, MIT Press, Vol. 13. Hovakimian, Gayane; 2009, "Determinants of investment cash flow sensitivity", Financial Management 38, No. (1). Kaplan, S. N; Zingales, L; 1997, "Do investment-cash flow sensitivities provide useful measures of financing constraints? ", The Quarterly Journal of Economics, No. 112(1). Lewellen, Jonathan; Katharina Lewellen; 2013, "Investment and cashflow: New evidence", Forthcoming in Journal of Financial and Quantitative Analysis. Love, I; 2003, "Financial development and financing constraints: International evidence from the structural investment model", Review of Financial Studies, No. 16(3). Moshirian, F; Nanda, V. K; Vadilyev, A; Zhang, B; 2013, "What drives investment-cash flow sensitivity around the world? ", In 8th Annual Conference on Asia-Pacific Financial Markets of the Korean Securities Association. Moreno Badia, M; Miranda, V; 2009, "The missing link between financial constraints and productivity", IMF Working Papers, International Monetary Fund, No. WP/09/72. Raddatz, C; 2006, "Liquidity needs and vulnerability to financial underdevelopment", Journal of Financial Economics, No. 80(3). Roodman, D; 2009a, "A note on the theme of too many instruments", Oxford Bulletin of Economics and Statistics, No. 71(1). ___________ ; 2009, "How to do xtabond2: An introduction to difference and system GMM in Stata", Stata Journal, No. 9(1). Strebulaev, I. A; Whited, T. M; 2011, "Dynamic models and structural estimation in corporate finance", Foundations and Trends in Finance, No. 6(1-2). Tong, H; Wei, S. J; 2011, "The composition matters: capital inflows and liquidity crunch during a global economic crisis", Review of Financial Studies, No. 24(6). Whited, T. M; 1992, "Debt, liquidity constraints, and corporate investment: Evidence from panel data", The Journal of Finance, No. 47(4). Windmeijer, F; 2005, "A finite sample correction for the variance of linear efficient two-step GMM estimators", Journal of Econometrics, No. 126(1).